After touring Japan for nearly 3 months, we finally reached Mito city, Ibaraki Prefecture; the last city of World Campus International’s premier tour. We were invited by the Ibaraki University Elementary School for their special week to celebrate the 50th anniversary of that institution. Each of our participants had a class of their own for the entire week. On the first day, the World Campus – Japan class had a welcome session and we were introduced to the 40 children that we were each working with. They had been preparing for our visit for more than a month, so they were extremely happy when we arrived. Our final “Arigato Evento” (Thank-you event) in the prefectural hall with a capacity of 1,700 people was an extraordinary experience. We taught a few songs and movements to the children during our stay at school, and it was an impressive image to see all 700 kids singing and moving together with us. Even from the stage, we could see some parents shedding tears. 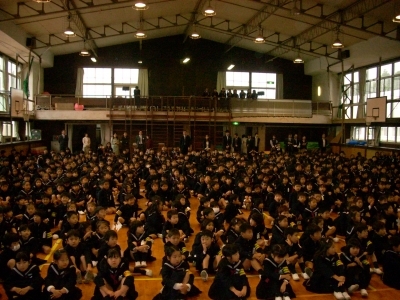 On the following day at the Ibaraki University Elementary School’s official 50th anniversary event, we realized that the children and our class had gotten so close, and it was as if we were looking at our own students when each grade performed on the stage. When the last day at Mito was over, it was hard to believe that it was time to say good-bye not only to our classes behind, but also to the fellow WCI participants, who truly became family members.